While Chateau Maucoil only has a short history as a vineyard, the estate has a long history in the Southern Rhone Valley that dates back to the Ancient Romans who used the property as an army fortress. Vines were planted in what we know of as Chateau Maucoil during the mid 1600’s. 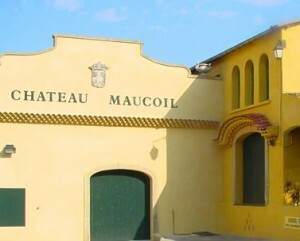 However, the modern era for Chateau Maucoil begins in 1995 when the property was purchased by the Arnaud family. The Arnaud family were well-known in Chateauneuf du Pape as they already owned Chateau Cabrieres. Today, Chateau Maucoil is managed by Benedicte and Charles Bonnet. In 2013, Chateau Maucoil was purchased by the Lavau company, a negociant firm located in Violes, France. Chateau Maucoil has 36.5 hectares of vines in Chateauneuf du Pape. 34 hectares are used for the production of red wine grapes. 2.5 hectares are planted for white wine grape varieties. Chateau Maucoil also owns 17 hectares in Cotes du Rhone and 3 hectares of vines classified as IGP. In 2014, Chateau Maucoil was certified as being 100% biodynamic. Their vineyards are located in various areas of Chateauneuf du Pape which gives them a terroir that ranges from sand, to rocks, stones, limestone to clay soils, depending on the specific lieu-dit. Chateau Maucoil produces 3 red Chateauneuf du Pape wines and 2 white Chateauneuf du Pape wines. Chateau Maucoil Tradition is produced from 60% Grenache, 15% Syrah, 12% Mourvedre, 10% Cinsault and various assorted grape varieties. The terroir is sand, limestone, rock and stone soils. The wine is aged in a combination of demi-muids and used oak barrels for 12 months. The production is close to 8,500 cases of wine per year. Chateau Maucoil Privilege is produced from 40% Grenache, 15% Syrah, 12% Mourvedre, 8% Cinsault and various percentages of Vaccarese, Counoise, Muscardin, Picpoul, Picardan, Clairette, Bourboulenc, Roussanne and Terret Noir. The terroir is sand, limestone, rock and stone soils. The grapes are destemmed and co fermented. The wine is aged for 12 months in 30% new French oak barrels and used oak barrels for 12 months before bottling. The production is close to 800 case per year. Chateau Maucoil L’Esprit de Maucoil comes from the estates oldest vines and is a blend of 75% old vine Grenache and up to 13 different grape varieties. The terroir is sand, limestone, rock and stone soils. Yields are low with this wine. They can be close to 10 hectoliters per hectare. The wine is only made in the best vintages. The wine is aged in 30% new, French oak casks and used, French oak barrels for 12 months before bottling. When it’s produced, close to 350 cases are made. Chateau Maucoil Chateauneuf du Pape Blanc is produced from a blend of 30% Grenache Blanc, 30% Clairette, 30% Bourboulenc and 10% Roussanne. Chateau Maucoil Tresor des Papes Blanc is produced from a blend of 30% Grenache Blanc, 30% Clairette, 30% Bourboulenc and 10% Roussanne from vines that are between 45-50 years of age. Chateau Maucoil can be enjoyed on the young side. Young vintages can be popped and poured, or decanted for about 1 hour or a bit longer. This allows the wine to soften and open its perfume. Older vintages might need very little decanting, just enough to remove the sediment. Chateau Maucoil is usually better with 2-4 years of bottle age. Of course that can vary slightly, depending on the vintage. In the best vintages the wine should be consumed within 3-15 years after the vintage. Chateau Maucoil is best served at 15.5 degrees Celsius, 60 degrees Fahrenheit. The cool, almost cellar temperature gives the wine more freshness and lift. Chateau Maucoil is best served with all types of classic meat dishes, veal, pork, beef, lamb, duck, game, roast chicken, roasted, braised, stewed dishes, sausage, grilled meats, barbecue and cassoulet. Chateau Maucoil is also good with Asian dishes, hearty fish courses like tuna, mushrooms, cheese pasta, eggplant and tomatoes. The white wine of Chateau Maucoil is best served with a myriad of different seafood dishes, shellfish, crab, lobster, sushi, sashimi, chicken, pork and veal, as well as Asian cuisine. Peppery black raspberries, flowers and kirsch rise to the surface in the nose. On the palate, the wine is polished, softy textured with silky tannins and layers of sweet,, ripe, fresh, juicy, ripe dark, red fruits. The white wine grapes in the blend add the perfect, exotic, lush note. The wine was produced using a Grenache, Syrah and Mouvedre blend with several other assorted grape varieties. Rich, peppery and fresh, there is a minerality that adds to the complexity, along with olives, garrigue, plum and cherry notes. The wine is full, round and forward, with lots of spicy, sweet fruit in the finish. The wine was produced using a Grenache, Syrah and Mourvedre blend that includes various other allowable grape varieties. There is a sweetness in the cherries in the nose, which moves you to a plush textured, full bodied, supple styled wine with layers of ripe, red berries and spice in the finish. The wine was blended with 60% Grenache, 15% Syrah, 15% Mourvedre and 10% Cinsault. Lush, polished, elegant, fresh red fruits, smoke and incense, with a shot of pepper for good measure create the nose. Once there, the wine is full bodied, round and fresh, with a fleshy, spicy, kirsch filled finish. Floral notes bring a lot to the cherry and kirsch on the front end. Lush, sweet, fresh and loaded with juicy, vibrant, red fruits. The finish has sticking power. The inclusion of white wine grape varieties add aromatic complexities and more roundness to the finish. Medium bodied, spicy, red berries, kirsch and herbs pop right up. Fresh and lively, with a kick from all the juicy, peppery kirsch which is there to round out the finish. Perhaps it was the addition of the white wine grape varieties that gave the wine more depth and body in this difficult year. Soft, smooth and delicious, the finish is packed with sweet, blackberries, kirsch and black pepper. This could use a year or two in the bottle while will make it even better and more fun to drink. Medium bodied, early drinking, forward, crowd pleaser with fresh, lively, crisp, spicy red fruits and an energetic, peppery, finish. All the new oak has faded into the wine allowing the fresh, spicy, kirsch notes and round textures to shine through. The wine was made from a blend of 50% Grenache, 15% Syrah, 12% Mourvedre and 8% Cinsault. Blending red and white grape varietals gives the wine an exotic quality to the nose and texture that helps to showcase the spicy, fresh fruit charm. Produced from a blend of 50% Grenache, 15% Syrah, 12% Mourvedre and 8% Cinsault. Open, medium bodied, forward, easy to like, taste and enjoy, due to its accessible red fruit character. Silky, fleshy, sweet and long, there is a nice quality to the melange of kirsch and dark red berries in the wine. A round blast of ripe, spicy black cherry and spice come out of this blend of Blending 60% Grenache, 20% Syrah, 10% Mourvedre and 10% Cinsault, the wine reached 14.5% alcohol. Light in color, soft in texture, ripe in fruit and forward in its cherry and red plum character, the wine was produced from a blend of 50% Grenache, 15% Syrah, 12% Mourvedre, 8% Cinsault and the remainder coming from assorted varietals, the wine reached 15% alcohol. A nice character driven wine, that sells for a fair price, with lots of fresh, ripe, peppery, black raspberries, kirsch and garrigue that is already tasty. On the lighter side, with soft, round textures , the fruit is bright, with a lean to the red cherry and wild strawberry side of the style range. I'd look to drinking this on the young side.